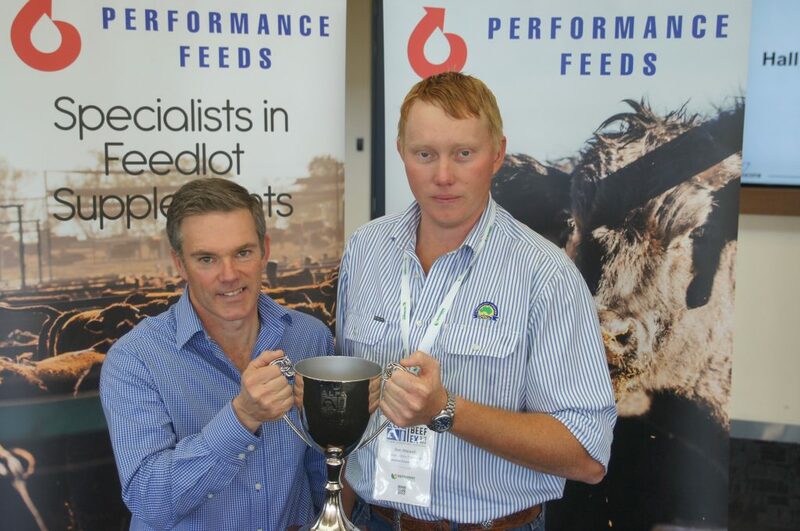 Performance Feeds’ Scott Sloss congratulates 2018 Young Lot Feeder of the Year Ben Attewell from ACC’s Brindley Park. THE 2018 Young Lot Feeder of the Year Ben Attewell knows all about responsibility. At any given time the 27 year old has tens of million dollars of cattle under his direct care as the manager of Australian Country Choice’s 22,000 head Brindley Park Feedlot at Roma. On Tuesday night Ben joined an illustrious list of industry achievers (see below) when he was named the 2018 Australian Lot Feeders Association’s Young Lot Feeder of the Year. The award, sponsored by Performance Feeds, is designed to encourage emerging feedlot industry employees to contribute their ideas and vision for lot feeding at a national level. Ben based his entry on a call for the industry to adopt a universal standard to overcome the costs of induction shrink. “It is something I don’t think we measure well in our industry, especially in cattle that are close to home, I don’t think we have a good grasp on it at all,” he told Beef Central. “If we buy cattle that aren’t correctly shrunk what we’re paying for is gut fill and urine at whatever rate we buy them, and then we don’t have an accurate start weight to start your animal on, which means we can’t determine a correct ADG (Average Daily Gain) and accurate cost of gain. Ben said he believes the industry needs to adopt a universal standard to ensure cattle are correctly curfewed and a correct induction weight is determined. Ben grew up on his parent’s cattle property near Casino in New South Wales. He said he always wanted to work in the cattle industry but it was only when he successfully applied for a position as a pen rider at AACo’s Goonoo Feedlot in Central Queensland that he developed a strong interest in the intensive cattle feeding industry. After 10 years at Goonoo he accepted a job with Australian Country Choice three years ago, and is now manager of the company’s Brindley Park Feedlot. “I like the intensity of it (working in the feedlot industry), the impact you can have today, you can measure it tomorrow, you don’ have to wait,” he said. Ben is one of the very few entrants to have won the Young Lot Feeder of the Year award in his first year of applying. “It is something I always wanted to go in, but something I probably never thought I had the time to go in though,” he said. Mr Attewell’s fellow grand finalists in the competition were Fiona McDiarmid from Terence Vale Feedlot at Theodore and Georgia Birch from Smithfield Cattle Company at Proston. The Three Grand Finalists were invited to present their industry issue topic at the BeefEx conference in Brisbane this week. Congratulations Ben – The ACC teams are very proud of your achievement. When you look at the list of previous finalists and winners; this competition has a wonderful history of identifying future leaders in the Feedlot sector. Our industry should take great pride and comfort that it’s future will be shaped by the calibre of young professionals identified as finalists this year..